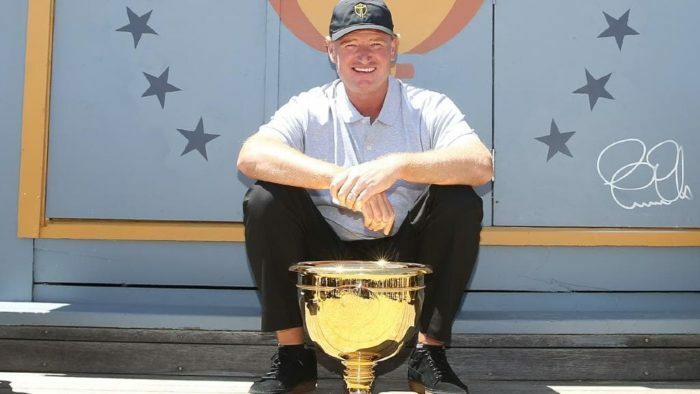 How good it was to see Ernie Els back in the city where it all started to happen for him. Back in Johannesburg, and in the commentary box at the cricket. We all know that Els, the four-time Major champion and one of golf’s Hall of Famers, is one of South Africa’s favourite sporting sons. He finally settled on golf, but was no slouch when it came to rugby, cricket and tennis in his school days and has often popped up at an international venue to support his countrymen. Els has rung the bell at Lord’s, he’s handed over jerseys to the Springboks in their pre-match get-together, he’s got genuine friends across many codes and he’s a great sporting ambassador for his country. In the commentary box at the Wanderers Test, where South Africa completed a 3-0 whitewash over Pakistan, Els was with former cricketers Shaun Pollock and Kevin Pietersen, and the subject quickly switched from cricket to golf. Pietersen is down to a six-handicap and says he picked up an interest in golf only after the 2007 Cricket World Cup in the Caribbean, but that he now plays as much, if not more, than any professional golfer. He used to be a workhorse in the nets and has taken that work ethic to the driving range and putting green. He still claims to be ‘self-taught’ when it comes to golf, rather than having had dozens of lessons. Pollock is a single-figure handicapper and one of many top cricketers who have gone on to be very good golfers. During conversation, the camera panned to the adjoining Wanderers Golf Club and then some images of a golfer missing a tiddler of a putt, from a foot. ‘Reminds me of a few putts of mine,’ Els chipped in, no doubt in reference to the six-putt he made on the opening hole of the 2017 Masters at Augusta. It was a relaxed Els behind the microphone in what is a big year for him. He turns 50 in October and then captains the International team at The Presidents Cup against the United States at Royal Melbourne in December. ‘The timing of my birthday is unfortunate,’ he said when asked whether he will be playing on the lucrative ‘Seniors Tour’, as the PGA Tour Champions is called. The Tour started in January, and by the time Els hits 50 there will only be four events left, so he will likely wait until 2020 before he starts playing it competitively. With a huge grin he said he likes the fact ‘there are three rounds [54 holes] with no cut,’ which in essence means there’s a cheque every time one tees up on the Tour, but it also means that without the pressure of making a cut one can be more aggressive with shots and try to make plenty of birdies. One of the important things Els mentioned was that golf is one of the few sports where players at every level can compete against one another – the handicap system – and this in essence is the beauty of the game, while it doesn’t discriminate against age. Imagine facing Dale Steyn in the nets – like Piers Morgan did against Brett Lee to feed his own ego in a publicity stunt? One can’t. But take on a professional golfer according to your handicap and you’ve got a chance, an outside chance, admittedly, of beating them.